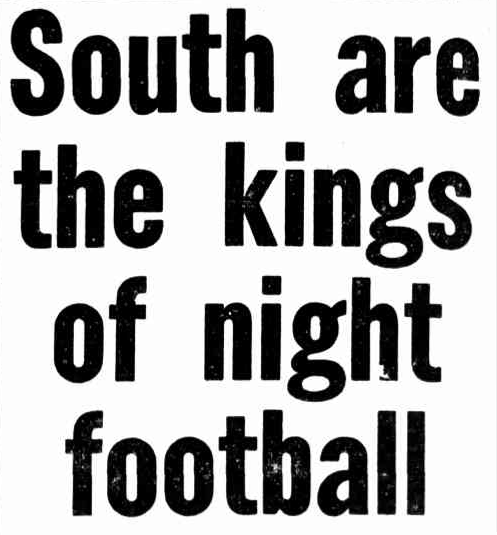 Years of frustration and false starts had seen metropolitan Melbourne fall behind other regions in the race for night football. The deadlock was broken when the South Melbourne Cricket Club (SMCC) decided to invest in four light towers to enable night football, soccer, baseball and other sports to be played at the venue. *The eight teams that missed the VFL finals series competed for the K.G. Luke Trophy (valued at £75 and donated by VFL President Kenneth Luke) with the winning team receiving a £200 cash prize. *The Lake Oval was the venue for the series, and also the home ground of the South Melbourne Football Club, so it was natural that the Swans played in the inaugural match. This soon developed into something of a tradition with South playing the opener in ten of the fifteen series they participated in during this era. *Specially-made white footballs (manufactured by both Sherrin and Ross Faulkner) were used throughout the competition. *An exhibition match was played in the period between the night series second semi-final and Grand Final. 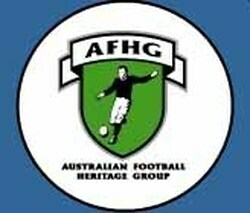 This was a charity match between the teams finishing 3rd (Footscray) and 4th (Geelong) in the VFL premiership. The match was a fundraiser for Operation Gratitude, a massive fundraising campaign for the RSL and Legacy which ran throughout the second half of 1956. *The series was originally meant to involve VFL and VFA clubs but the VFL chose to go it alone after the SMCC set a deadline of September 12th for the night final to be played (that deadline was later extended to September 17th). The VFA home & away season only ended on September 1st which did not leave enough time for a joint series. *For this inaugural series no dividend sharing arrangement with the top-four clubs (who were playing in the VFL finals) was in place. The relatively large night series crowds meant a bottom-eight club that lost their opening round match in the night competition would bank around £700, with the winning club making as much as £2000. This was considerably more than the VFL's top-four clubs who had to divide their finals takings among all 12 clubs. Listed below are match reports for all 7 games played during the series plus the exhibition match. This is the first time these reports have been collated and published online or in print. Unless otherwise noted the information was sourced from The Football Record and The Age newspaper. at the other end of the field resulting in "opposing players swinging punches wildly". Umpires were this time assisted by police to end the melee. Operation Gratitude was a massive fundraising campaign for Legacy and the RSL that ran throughout the second half of 1956. For winning the series South Melbourne received a cash prize of £200 and the K.G. Luke Trophy (valued at £75).